"HL Biology - Graduate in 2020"
This is what students do when you invite them. When students navigate to the link above they first see this page. login with their existing account. It will add Biology to their list of groups. Otherwise - click create new account. This is what the student signup page looks like. make a note of the email address you used. 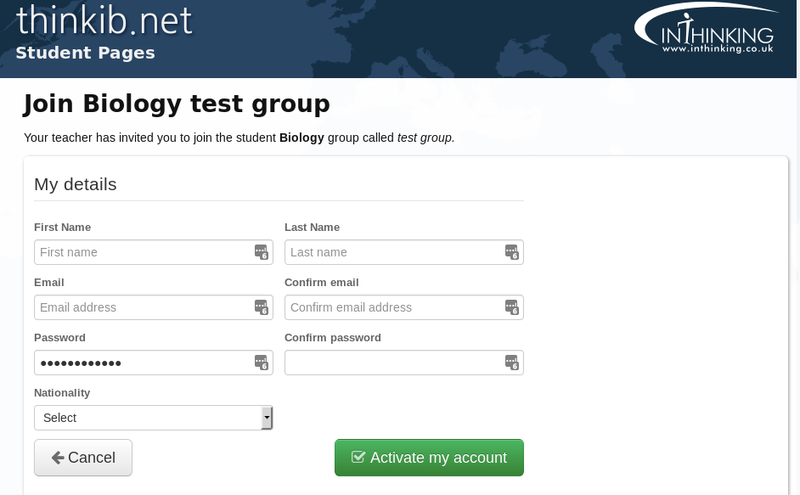 This will get students to their student dashboa rd with links to all their groups. It will also link to any other subjects which have subscribed to InThinking. or navigating to Assignments in the drop down list from your name. Once you have joined the group there is only one URL to remember. Lastly, check that you can find the site again and login successfully. Log out - using the drop down list from your name.